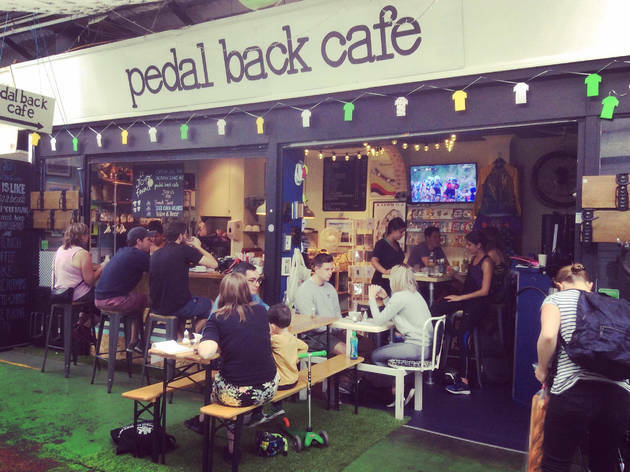 A cycle café in Tooting. A cycle café in Tooting serving simple cakes (such as Guinness and chocolate) and a small selection of espresso-based coffees. There is also a bike repair area where you can book your bike in for standard repairs. It is inside Tooting's covered market and although it's perhaps not the finest coffee served in Tooting, it's inexpensive and a chilled place to wait while having work done on your bike. Cycling + coffee + cake. Enough said! Excellent coffee, unbelievably good food AND super cycle maintenance. What's not to like? Realy nice coffee. Great food! Pop in for a delicious meal. You can also get your bike repared. The best breakfast and brunch there is. It might take a little longer than the ever growing chains of cafes but the personal touch means amazing food every time!! Not to be missed! Brilliant. Wonderful food and drink AND get your bike fixed/serviced at the same time! Best cycle and only cycle cafe for miles. Food and coffee are delicious! Really friendly service too. I love this place! The food is gorgeous (they come up with some great unique combinations), the cakes are to die for (yes I've nearly tried them all), they are so friendly & its such a nice place to be! Love this cafe. Delicious coffee and cake...and bike back in shape too!. Top place to stop and refuel when out on a ride, or just to check out the coffee and cake without a bike, delicious! Best sandwich in Tooting - toasted stilton, caramelised red onion and walnuts, oh want one now! A Café with a difference, delicious food at very reasonable prices. Should you be a cyclist treat your bike as well. Get it serviced or browse a great choice or merchandise focused on bicycles. This hidden gem in the Broadway Market, Tooting, has a great vibe with friendly staff and excellent home made food and cakes. Also, it has the added bonuses of a nice selection of presents for sale and bike repair. 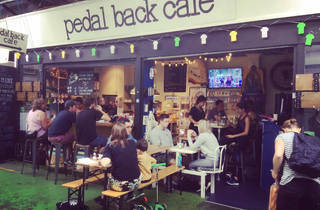 great local find in Broadway Market - great coffee, brunch and cakes and really friendly staff and bike mechanics. Love this little place!! Fabulous little cafe. Delicious food, great bike service and super-friendly! Delicious breakfasts, good coffee, and general all-round-nice-folk. And they're pretty good at bikes too. Marvellous.